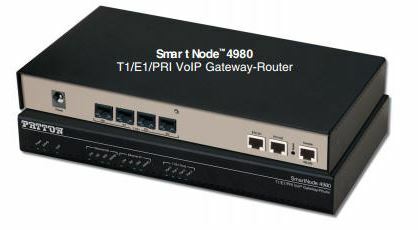 The Patton SmartNode 4980 is a PRI gateway-router which provides 1 to 4 T1/E1/PRI and a 10/100/1000 Ethernet for up to 120 VoIP calls. Enterprises can now quickly, easily, and affordably IP-enable legacy PBX systems to deliver toll quality voice on every call. For more information call us at 610-399-3911.